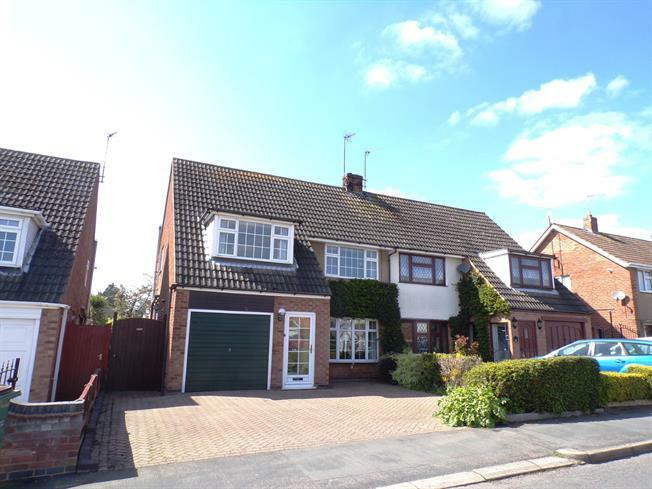 3 Bedroom Semi Detached House For Sale in Wigston for Offers Over £230,000. Located on the ever popular Fairfield Development, this much loved family home which has spacious accommodation and a fantastic rear garden. Entrance porch leading to the entrance hall, a generous lounge with dining area, extended breakfast kitchen, garden room, wc. To the first floor there are three good size bedrooms and a family bathroom, private rear gardens, single garage and driveway. Upvc double glazed door to the front, upvc window to the side. Upvc double glazed window to the side, stairs rising to the first floor. Double aspect double glazed uPVC windows facing the rear and side. Radiator, vinyl flooring. Roll top work surface, wall and base units, double sink and with mixer tap, integrated oven, gas hob, overhead extractor. UPVC French double glazed door, opening onto the patio. Double glazed uPVC window facing the rear overlooking the garden. Radiator, tiled flooring. Sliding . Double glazed uPVC window with obscure glass facing the side. Tiled flooring. Low level WC, wash hand basin. Having up and over door, power and lighting, wall mounted boiler. Double glazed uPVC window facing the rear overlooking the garden. Built-in storage cupboard. Double glazed uPVC window facing the front. Radiator, fitted wardrobes and built-in storage cupboard. Double aspect double glazed uPVC windows with obscure glass facing the rear and side. Radiator. Low level WC, panelled bath, single enclosure shower, wash hand basin. To the front of the property is a block paved driveway with shrubbery to the side. A wide secure side gate leading to the rear garden which is mature and well proportioned. A charming paved patio area with feature raised pond, lawned area with established borders filled with plants and perennials, further seating area with pergola, greenhouse, garden shed to the rear with further shaped lawn, enclosed by timber fencing.